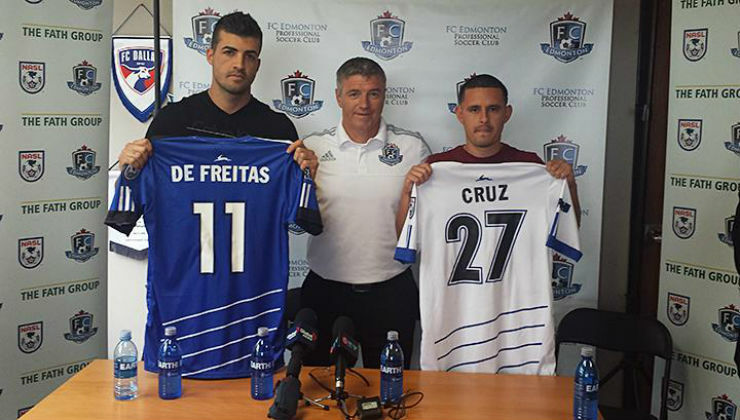 FC Edmonton announced Thursday that it has come to an agreement with midfielders Pablo Cruz and Thiago de Freitas, pending international clearance. Cruz arrives in Edmonton following a stint with the San Antonio Scorpions after spending three years as a member of the Atlanta Silverbacks, where he played from 2012-14. Last Fall Season, the 23-year-old, attacking midfielder accumulated three goals, three assists, and 1,101 minutes played through 16 matches. De Freitas arrives from AOT Alimos (A.O Trachones F.C.) where he played a half season in Greece’s second division. Prior to Greece, de Freitas spent a year in Isreal with Hapoel Nir Ramat HaSharon, collecting two goals and two assists in 18 matches. The well-traveled, 27-year-old central midfielder has played in multiple countries that include Hungary and Portugal. “We’ve watched extensive video and highlight footage of Thiago,” Miller added. “He comes from an excellent background and an excellent football pedigree. There are players that I’ve spoken to from within our league that have said what a good player we are getting, and we expect him to make an immediate impact. I think he’ll be a terrific signing for us.